Time and again she seeks out the challenge of a first performance – perhaps, too, because she regards the chance to engage in a dialogue with living composers as a form of refuge before she returns to a repertory she has known for thirty years and which she nonetheless feels each time is a terra incognita. Above all, however, Anne-Sophie Mutter is motivated by the desire to keep on rediscovering the violin. That is why she seeks out composers who can coax new sounds from her instrument, finding new musical languages and awakening a new sensuality. She also enjoys returning to musicians she knows. “In the life of a soloist there’s more than just one facet. After premiering a concerto, I generally want a chamber work. This was the case with Krzysztof Penderecki’s Metamorphosen and would also have been the case with Witold Lutosławski if he hadn’t died first.” Wolfgang Rihm’s violin concerto from 1991, Gesungene Zeit, was initially followed by a second orchestral work, Lichtes Spiel, which received its first performance in New York in 2010. But this last-named work was followed almost at once by a piece of chamber music: Dyade. The differences between the two orchestral works are clear for all to hear and see. 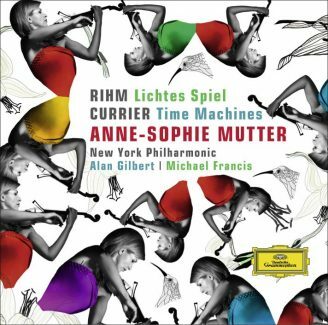 For Lichtes Spiel, Anne-Sophie Mutter wanted a Mozart orchestra. This intense and lyrical conversation that two people conduct with a single voice is a microcosm of miniature thoughts and ideas, not a musical dialogue in which a theme is expounded and taken up by the other instrument. Conversely, this classical approach is pursued by Krzysztof Penderecki in his Duo concertante, in which violin and double bass take turns to speak, one of the partners falling silent whenever the other has a clearly defined musical idea to express. “Here we toss balls to and fro or else we avoid one another. At the same time, the piece has at its command an inexhaustible rhythmic muscularity and exploits the incredible threat that is posed by the sort of attack of which the double bass is capable. I’m pleased to say that these two pieces explore the whole range available to these extremely disparate string instruments when they play together: the symbiotic fusion and the classical duo concertante form. We commissioned it because of Roman Patkoló. The double bass is still awaiting its renaissance as a solo instrument. Roman’s personality and his altogether inexhaustible virtuosity give any composer carte blanche.” Rihm in particular took advantage of this opportunity: technically speaking, Dyade is foolhardy to a fault, with insane leaps in the double bass and extremely demanding violin writing.